And a cute little stamp set from the Holiday Catalog called Oh, Goodie!. It has only 4 little words and is the coordinating stamp set for the Real Red Goodie Gear Simply Created Kit and the Pumpkin Pie Goodie Gear Simply Created Kit. 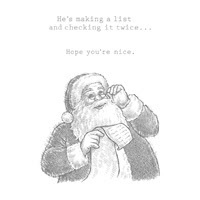 Stamp Set: Santa's List, Oh, Goodie! Accessories: Cherry Cobbler 1" Stitched Edge Grosgrain Ribbon, 1-3/4" Circle Punch, Scallop Circle Punch, Rhinestone Jewel, Blender Pends and stamp pads for coloring. LOVE the way you spotlighted Santa and just gave him a little color on his cheeks and face. I just love the look of this Santa. I hope he carry's over so we can keep him for a while.